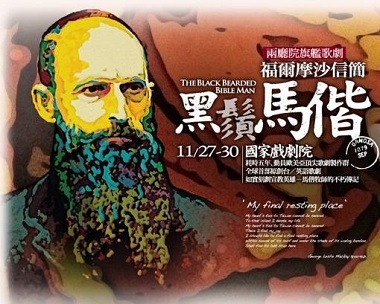 The film ‘Mackay: The Black Bearded Bible Man’ is a reminder of the missionary’s significant role in Taiwan’s history. Missionary George Leslie Mackay may be long since forgotten in his native Canada – but not in Taiwan. And a film being shown as part of the Vancouver Taiwan Film Festival tells the story. Mackay: The Black Bearded Bible Man will show this evening (June 8) at the Taiwanese Cultural Centre. Charlie Smith interviewed Cecilia Chueh, CEO of the Taiwanese Canadian Cultural Society about the Presbyterian missionary who spent the last 30 years of his life in Taiwan, before he died in 1901. According to Chueh, one of those students was a future president, Lee Teng-hui, and schools founded by Mackay educated many other members of Taiwan’s elite. “He was a hero in Taiwan – 145 years later, people remember him,” Chueh stated. “That’s why many Taiwanese people feel more close to Canada.” . . .
Chueh also stated that her grandfather was a student at a Mackay-founded school and became a Presbyterian minister. This is one reason why Mackay’s story has touched her so deeply. George Mackay with his wife Chhang-a and their three children. In Taiwan, where Christians constitute roughly 5 to 6 percent of the populace, George Leslie Mackay remains a widely known folk hero. Every day thousands of people pass by wall-size photographs of Mackay and his students at Taipei’s Mackay Memorial Hospital, one of the most respected medical facilities in the island. In 2001 the government in Taiwan issued a commemorative postage stamp to mark the centenary of his death. Christian parents can read children to sleep with tales of Mackay printed in cartoon storybooks, while a seemingly endless stream of newspaper articles, art prints, postcards, posters, wall calendars, mugs and medallions recalls his life. Preachers in Taiwan frequently draw upon his book, From Far Formosa (1895), for sermon illustrations, and politicians have appealed to his memory to promote various agendas.
. . . the missionary was dumbfounded when his wife and Koa Kau [a student from Taiwan] were not permitted to disembark until a head tax had been paid. Although the matter was soon cleared up, Mackay spent the rest of his time in Canada speaking out against racism and demanding an end to discrimination against Chinese immigrants. As moderator of the Presbyterian General Assembly in 1894, he had a very visible platform from which to thunder his opposition to anti-Chinese prejudice in Canada, as well as his faith in the complete equality of Chinese Christians. The screening, which is intended to celebrate Canada’s 150th birthday, is free. It is at 6 pm (not 8 pm, as stated in the Georgia Straight article).